ATRs are usually notified by the DOE on Thursday, the week before their new school placement. This was agreed upon with the union to give the ATRs a chance to contact the school for their scheduled times to report and whether there is parking available. However, many of the ATRs were not notified of their placement until Friday after 4pm, too late to contact the school. That means some ATRs will show up too early for a late schedule or too late if they are assigned an early schedule and have time deducted from their CAR. Who was responsible for this snafu? The DOE, of course. However, will anybody at the DOE be disciplined for their incompetence? Don't bet on that happening. Apparently, accountability are for teachers, if an ATR misses two mandatory interviews, they are fired. However, when somebody at the Central Bureaucracy screws up, they are not held accountable for their incompetence. Why Are Teachers Taking More Days Off? Its The Increased Stress And Lower Morale Stupid! The New York Post published an article that showed an astonishing 16% of the teachers took eleven or more days off during the 2013-14 school year. 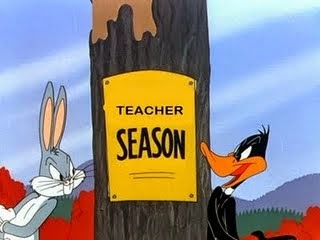 The DOE and the union couldn't explain the 10% increase in teachers taking more than the contractual ten sick days off. Of course the clueless Eric Nadelstern had his own idea and blamed in on retiring teachers who decided to take the extra days off. However, the truth is that the increasing stress of teaching in the classroom and the demonetization of teachers by the media and our Governor has added to that stress. The result is morale for New York City teachers is probably at an all time low and that's why teachers are taking more sick days than they are allowed in any one school year. When Bill de Blasio became Mayor and appointed Carmen Farina as Chancellor, UFT President Michael Mulgrew proclaimed that there was a different tone out of Tweed. However, its still the "gotcha mentality" when it comes to the classroom. Administrators are still dumping outrageous amount of paperwork on teachers, questioning their scholarship when teachers don't pass enough of their students, and failing to change much of the Bloomberg/Klein inspired policies that make teaching in the classroom a hostile environment. School after school I travel to, the teachers tell me the same thing. "I can't wait to get enough years in the system so I can retire". While all the teachers I encounter (there are a few exceptions) really care about the students, they just can't take the abuse anymore as the mind numbing mandates that emanate out of the DOE and implemented by the school administration makes going to work a chore. Moreover, its no fun for the classroom teacher who must spend their own money on supplies and even copying paper not to mention the totally ridiculous professional development that wastes our time for 90 minutes every Monday and 60 minutes every Tuesday. Finally, having the largest class sizes in the State only adds to the already stressful classroom environment as Governor Cuomo has shorted the City $2.5 billion dollars that was to reduce class sizes. If the City and Union wants to reduce the amount of "sick time" teachers take, then make the classroom a less stressful and hostile place by providing the necessary resources, reduce class size, and most importantly, let teachers teach that best help their students rather than being yanked around by the DOE mandates that are passed down to the schools that simply add unnecessary paperwork and added stress to the job. Just Another Case Of The DOE Double Standard When Disciplining Principals. The New York Post published an article about how Staten Island Principal Linda Hill. Yes, that Linda Hill who has a very close relationship with Chancellor Carmen Farina. Apparently, she was found to have "double dipped". Ms. Hill was accused of falsely obtaining per session money for one position while, at the same time, receiving money for another job after school that she was in charge of. Teacher and Chapter Leader, Francesco Portelos blew the whistle on her and forced the reluctant DOE to start an investigation on the "double dipping". To retaliate, Principal Hill had Mr. Portelos sent to the "rubber room" for two years until his case was resolved. Mr. Portelos has filed a federal lawsuit against Linda Hill and the DOE for retaliation and it was in this lawsuit that Principal Hill admitted to the "double dipping" and was waiting for the DOE to determine the discipline, if any. What happened to the DOE investigation of Principal Hill you ask? Well, it was apparently completed in 2013 and surprise, surprise, the DOE refuses to release the report. More importantly, Principal Hill has not had to pay the money back or was subject to any discipline, despite her admitting to "double dipping". If a teacher did what Principal Hill did, the teacher would be charged with "theft of service" and the DOE would file 3020-a charges against the teacher. Instead, in showing her support of Linda Hill, Chancellor Carmen Farina visited the school as the first school in Staten Island she visited as Chancellor. For more information on Principal Linda Hill please read my post on her Here Also read educator fights back blog for even more information on the alleged misdeeds of Principal Hill. This is yet another case of the DOE "double standard" when disciplining (lack of) administrators which started under the Bloomberg administration and continues under Bill de Blasio. I guess its good to have had the Chancellor as your mentor. update: According to the educator fights back blog, the DOE fined Linda Hill $801 in restitution. According to the blog she made over $56,000 in questionable overtime and her pension will reflect it. If I Became The Chancellor Of The New York City Schools. Readers of my blog know how critical I have been about the job Carmen Farina has done as Chancellor of the New York City schools. To say she has been a disappointment, is putting it mildly. Last month a DOE mid-level official and I had a pleasant conversation on the future of the public schools and this official asked me a simple question. 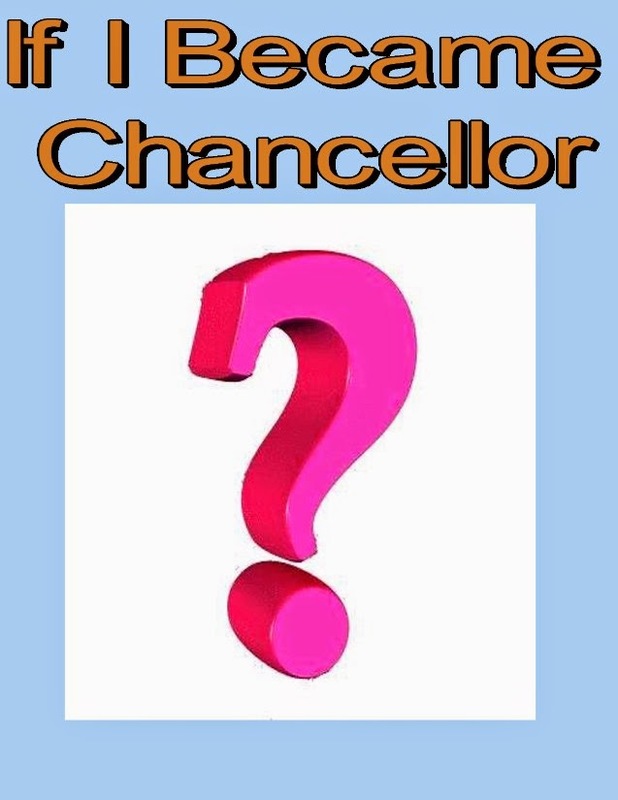 "What would you change as Chancellor"? That got me thinking of what would I do as Chancellor of the New York City schools? If I was Chancellor, here is what I would try to change. Clean house at the DOE: First, and foremost, I would remove the "Bloomberg 300" that Carmen Farina left in place in policy making positions. Their removal is necessary if we are to eradicate the Bloomberg ideology that is imprinted throughout the DOE. 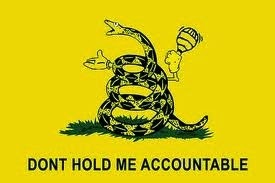 Moreover, I would severely downsized the accountability and legal departments. Eliminate fair student funding: The fair student funding fiasco is a failure and forces principals to hire the "cheapest and not the best teachers" for their schools. Reinstall the unit method that requires DOE Central to allocate staff to each school, based upon their student population, without salary being a consideration. Principals would no longer have any incentive to hire cheap since it does not come out of their budget. Reduce the Bureaucratic Bloat at the DOE: In addition to reducing the accountability and legal departments, I would hire a company to evaluate and eliminate redundant and unnecessary positions within the DOE. The money saved will be allocated to the schools to hire additional staff, reduce class sizes, and provide extra resources to the schools. Reevaluate principals: There are just too many principals who are not capable to collaborate with their staff and are not providing the proper leadership to help their students. I would work with the newly empowered Superintendents and the school staff to determine which principals should stay and whom should leave. I would totally eliminate the "Leadership Academy" and future principals will come from the ranks and who were successful long-term classroom teachers and assistant principals. Eliminate the ATR issue: A priority will be to place the ATRs back into the classroom as quickly as possible. All vacancies in the District will not be filled until the ATRs in that District are placed. To ensure that there is truly mutual consent, the ATR and Principal would both need to agree to the placement. If both agree that its been a good fit, then the ATR will be appointed to the school the following year. This will save the DOE $150 million dollars annually and supply schools with experienced teachers. Stop the use of uncertified teachers: Too many schools are using teachers not certified in subjects they are instructing students in. This will stop with the end of the fair student funding since schools will have the appropriate units to hire qualified staff, without having to consider salary. Reestablish the "600 schools": For students that disrupt the schools with repeated behavioral actions, its time to send them to schools where they can still receive an education but with a staff that is experienced in handling behaviorally challenged students. Obviously the school administration and staff should be paid a pensionable stipend for working in these schools. No co-locations with public schools: If charter schools need space, let them find and fund it themselves or force the State to pay for the space. I'm sure there's more, but these would be my priorities as the next Chancellor of the New York City public schools. 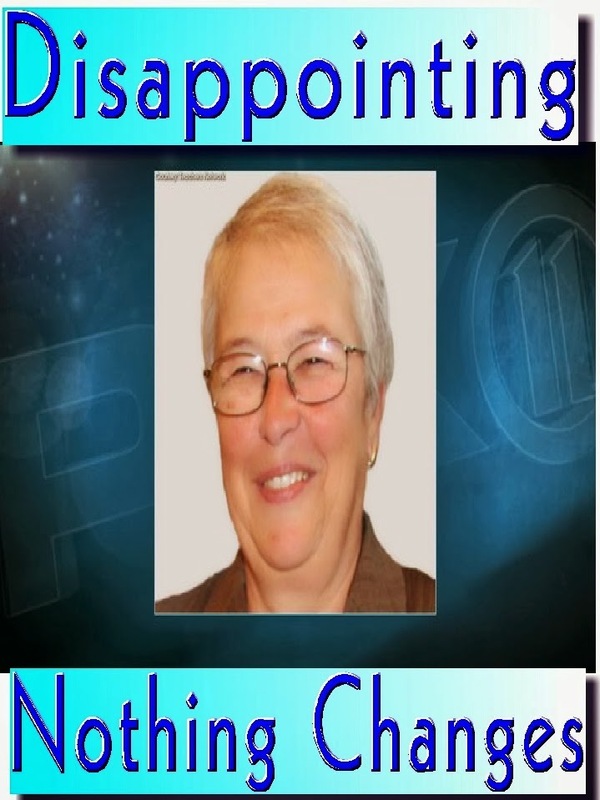 Chancellor Carmen Farina Fails To Remove Problem Principals. When Bill de Blasio became Mayor of New York City, many teachers were hoping for massive changes at Tweed. The antagonistic tone coming out of the DOE would be replaced with a collaborative atmosphere that would result in positive changes to the classrooms and help the City's public school students. However, under the disappointing Chancellor, Carmen Farina, little has changed at the school level. Under Carmen Farina's tenure, school budgets remain frozen at levels 14% less than in 2008. The continuation of the "fair student funding" that encourages principals to hire the "cheapest and not the best" teachers for their schools. No reduction in the large class sizes that are the largest in the State. No change in the overwhelming paperwork requirements used by Tweed for data mining and the wasting of over $150 million dollars by keeping ATRs out of the classroom, a continuation of the punitive and ideological Bloomberg/Klein policies. However, the worst aspect of Carmen Farina's Chancellorship was her failure to "clean house" both at the DOE and especially the large group (300) of "Leadership Academy principals" that she claimed shouldn't be running their schools. Throughout the last few years many of these principals have found themselves in trouble but yet survived their sham or nonexistent DOE investigation to continue to run their schools into the ground. Here is a partial list of some of these principals who made the newspapers because of their questionable actions. Moreover, here are other school administrators that appear to be in serious need of remediation. Is it any wonder that principals are happy with Carmen Farina as Chancellor? Under the disappointing Chancellor, its still a "double standard" and when that issue is added to her failure to remove the Tweed 300 from policy making positions, it shows that for the classroom teacher its DOE business as usual and that's bad. update: Read the New York Post article on the admitted "double dipping" by Linda Hill and yes, the Chancellor still kept her on as Principal! Unbelievable! Namita Dwarka, Another Leadership Academy Principal That Needs To Go. 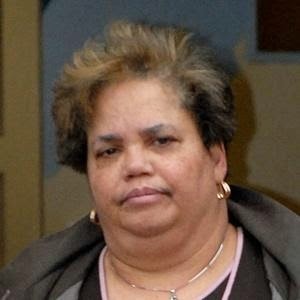 Once again the Principal of William Cullen Bryant high school has found herself in hot water. This time its about a missing $195 thousand dollars that was collected for gym uniforms, locks, and food. Apparently a DOE investigation found no receipts for the money allegedly spent. However, the DOE has failed, once again, to discipline and remove the infamous "Leadership Academy Principal" Namita Dwarka. Moreover, a veteran physical education teacher, Peter Maliarakis has claimed that money raised with the sale of the uniforms and locks that should have been allocated to upgrade the gym and to buy new gym equipment was not used for those purposes. The New York Post article can be found Here. Namita Dwarka has been in trouble before but yet the DOE has failed to act. Last year there was the Regents cheating scandal where the school administration falsely labeled English speaking students as ESL, to give them extra time and higher grades on the Regents. Earlier in the month 200 students, parents, and teachers protested outside the school against the Principal and her policies that shortchanged special education students and eliminated academic programs. She allegedly was accused of threatening students who joined the protest in not being allowed to attend their graduation ceremony. Again, the DOE refused to take any action. Then there was the allegation of the Principal changing grades to raise her graduation rate. However, the DOE failed to take action against Namita Dwarka, despite the many students and teachers willing to testify to the grade changing. She has shown her vicious side too by retaliating against staff and students who dare stand up to her. Here is a letter that was sent to Mayor Bill de Blasio, Chancellor Carmen Farina, and the Queens Gazette outlining the issues. Finally, she has a terrible reputation with the ATRs as she refuses to hire veteran ATRs and has been accused to have placed uncertified teachers in rather than select a veteran certified teacher for some hard to staff subjects. This is just another case of the DOE "double standard" in protecting bad principals while going after teachers, despite the change at the top. Update: Staff and student protests against the principal is scheduled for March 26 at 3:30 pm. The Quality Teacher Myth In New York City Public Schools. One of the most important factors for children to maximize their academic potential at school is to have a "quality teacher" instructing them. While the various interest groups can differ on what makes a successful student, they all agree that a "quality teacher" is instrumental in student academic success. Yet, when we look at the New York City Public School System, we find that their hiring practices and policy discourages the schools from selecting "quality teachers" and forces them to hire the "cheapest and not the best teachers" for their students. Is it any wonder that the New York City Public school students continue to struggle academically? While external forces shape the majority of the child's academic development, like poverty, family, and community. A teacher can make up anywhere from a 1% to 14% difference in a child's academic outcome Therefore, if a school system really wants to maximize the child's academic potential, they should provide "quality teachers" to these students. However, in the New York City school system, its "education on the cheap" and the only hiring being done are the "newbies". For example, there were 6,000 teachers that left the school system last year. However, few ATRs were hired for these vacancies. Moreover, experienced teachers who wanted to transfer from their school and had ten or more years of experience, found that other schools were not interested in obtaining their services, despite their stellar record or reputation. Instead the schools hired "newbie" or untenured teachers, who have a steep learning curve to achieve "quality teacher" status, to fill these vacancies. The bottom line, until the City requires the DOE to revise their hiring practices and eliminate the "fair student funding" policy, its "education on the cheap" and continued poor student academic outcomes. 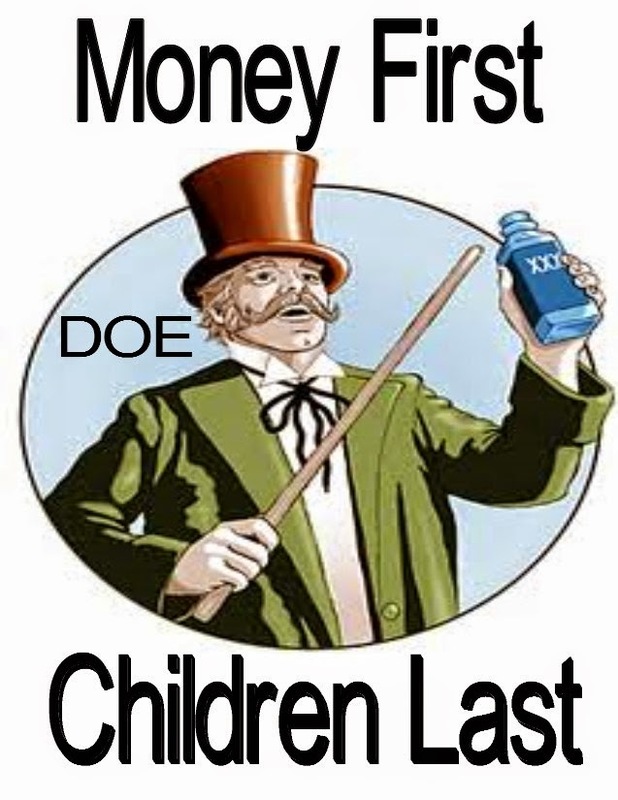 Just like a snake oil salesman, the DOE will claim its "children first" but in reality its all about the money and not about what's best for the students. 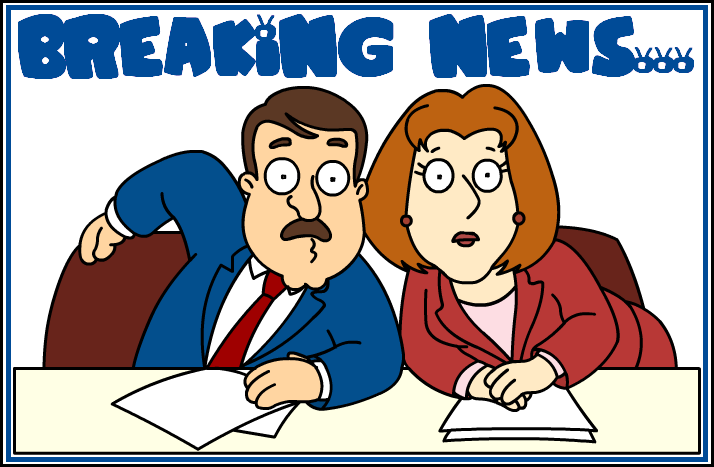 Breaking News - Our Union Sells Out Their Active Members Yet Again! The ICEUFT blog broke the news that the UFT leadership has quietly agreed with the arbitrator on how to give the retirees their retroactive raises, immediately, which is good but unfortunately, the active members will foot the bill. To pay for the $60 million dollar shortfall, because the union and City didn't anticipate the large amount of retirements, the contract will be extended an additional month, until November 30th, 2018 instead of October 31, 2018. Moreover, the final raise of 3% will be delayed six weeks, from May 1, 2018 to June 16, 2018. This will reduce the annual raises from 1.43% to 1.42% for the life of the contract. It may not sound like much of a concession. However, our already inferior contract becomes more so for the active members. Interesting how it became public on Friday afternoon, just as a week long holiday begins? I also noticed that the UFT did not mention it on their website or as a press release. Good job Mikey in screwing the members yet again! Why Schools Don't Do The Right Thing For Their Students. As I travel from school to school monthly, I have seen too many teachers who have some real deficiencies when it comes to instruction and classroom management skills. Quite a few are "newbies" and that's to be expected but some are experienced teachers that are teaching out of license. Worse, is that I have been in schools that have teachers who have no business teaching a subject they have little knowledge of. One example is Earth Science. In school after school, I have seen students being taught by teachers who are not certified Earth Science teachers and, as you can expect, their students do poorly on the Regents as a result. Examples of uncertified teachers teaching Earth Science are Richmond Hill and Newtown High schools, where there are multiple classes of Earth Science and to my knowledge, neither school has a certified Earth Science teacher on staff! Moreover, in the Bloomberg small schools many Science teachers are teaching multiple Science courses that they are not certified to teach and may have four different preps. You would never see this in the suburbs. According to the UFT, there are six certified Earth Science teachers in excess in Queens but since they are highly experienced and expensive, the schools will not do the right thing for their students and appoint one of them to improve the chances of their students in passing the Earth Science Regents, since its more important in hiring the "cheapest and not the best teachers" for their school. 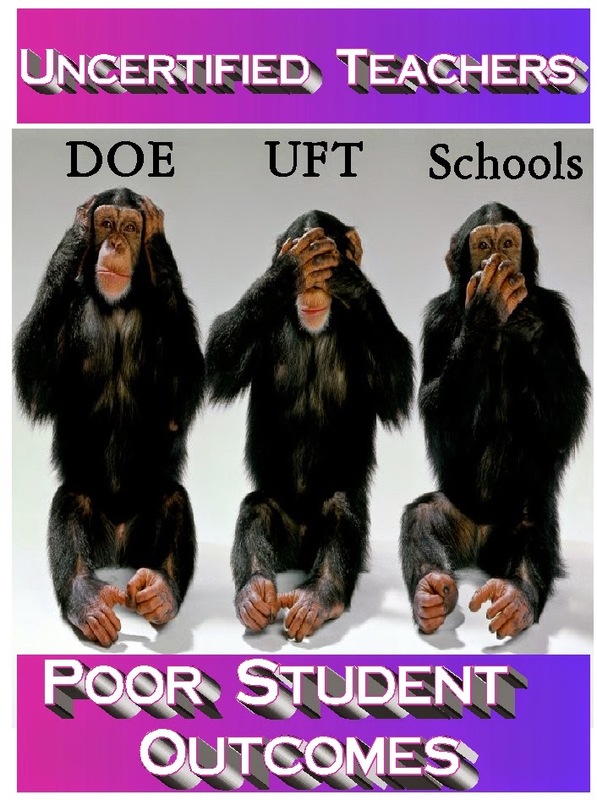 While the union could file a PERB complaint and publicize the educational maleficence that hurts the student's academic outcomes, the disconnected union leadership rather ignore this educational abuse and instead aids and abets the DOE in allowing it to occur. The union should be going after "fair student funding" and filing both a PERB complaint and informing parents that the DOE is allowing non-certified teachers to teach their students in subject areas like Math and Science. Instead its business as usual at the DOE practices its "education on the cheap" policy and the union just cheers them on. 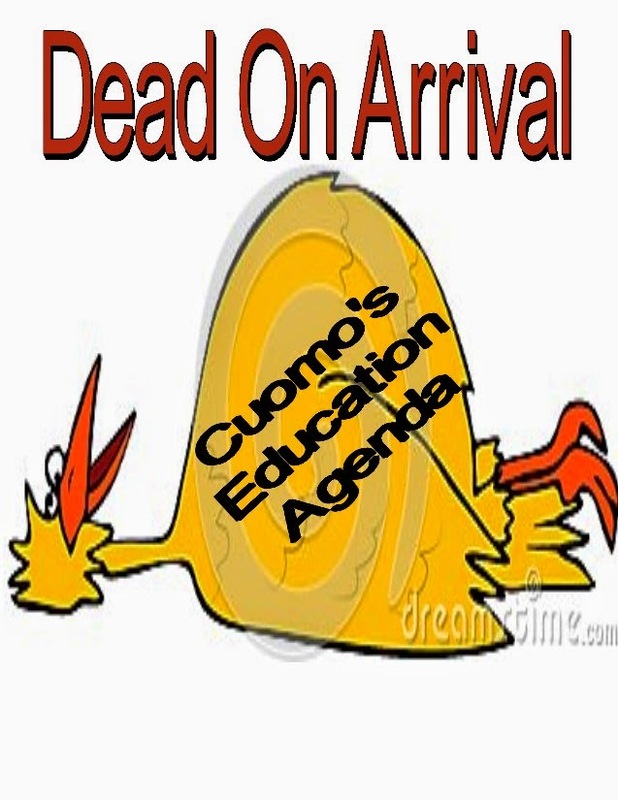 It Appears Cuomo's Education Budget Is Dead On Arrrival. Governor Andrew Cuomo's education agenda was always going to have a problem passing the Democratic controlled State Assembly but it now appears it won't pass the Republican controlled State Senate either. That means that the Governor's idea to hold school funding above the 1.7% increase hostage for his education agenda is dead on arrival. Senate Republican education chair, John Flanagan, told an audience of Long Island school district superintendents and board members yesterday that the Governor's proposed increase of $370 million dollars (1.7% increase) is inadequate. That the State legislature will reject his proposal to link funding to his education agenda that includes a more draconian teacher evaluation system, increased charter schools, and taking over struggling public schools. Senator Flanagan told the audience that the increase of $1.1 billion dollars (4.8% increase) is the floor and not the ceiling for increased State funding to the schools. Moreover, he also stated that he will push for the State to restore 50% of the money taken by the Gap Elimination Adjustment in next year's budget and that would release an additional $550 million dollars to the school districts. If John Flanagan is a man of his word, it appears that the Governor's education agenda and budget is dead on arrival. 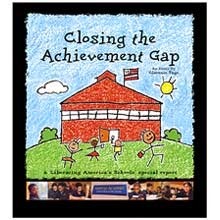 How Do We Close The Academic Achievement Gap? One of the major issues in the New York City public schools is the segregation of the schools and the unacceptably wide racial/income academic achievement gap. Many of the New York City schools are highly segregated and in a City that's known for its diversity, segregated schools are a problem. I previously wrote an article that showed, using the DOE's high school quality snapshot, that majority Black schools suffered from low college readiness scores. Moreover, in the high schools that had a 80% and higher Black student population, these schools ranked lowest in the rankings academically. While, the racial composition of the schools does appear to affect academic outcomes, there are other school factors that need to be taken in account. They are a stable administration, properly certified experienced teachers, reasonable class sizes, and adequate resources. 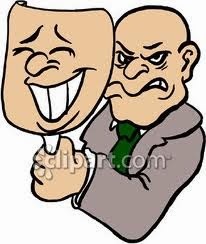 Unfortunately, many of there low preforming schools lack many, or all of these elements. A strong and dedicated school administration is extremely important for a school to succeed. That means a Principal and Assistant principals who fairly enforce student discipline codes, collaborate with the teaching staff, and support, not stab in the back, teachers who struggle with good pedagogy when dealing with the student population. A must for all schools is to have a nucleus of highly experienced teachers who have an institutional memory and can help mentor new teachers. Furthermore, these teachers should be certified in the core subjects of English, Math, Science, and Social Studies. Too many of the Bloomberg small schools lack such a nucleus. Finally, schools must be adequately resourced and funded and that means the DOE must eliminate the "fair student funding" that shortchanges the schools and forces principals to hire the "cheapest and not the best teachers" for their schools. An example of a failing school to me is "The Queens High School For Information Research And Technology" (QIRT) in the old Far Rockaway Campus The school's history show why it a failing school. First, the school lacks a diverse student body. Second, QIRT has had five principals in the last six years and numerous Assistant Principals that have come and go. Third, it suffers from high teacher turnover, with the most senior teacher being there only six years. It seems that 33% of the teaching staff leaves every year. Finally, student discipline is unevenly enforced as different administrations have their own ideas and ends up confusing students and staff alike. Is it any wonder that the school is failing? The DOE snapshot of QIRT can be found here. How do we desegregate the schools? First, you need to make these schools attractive to the student population. That means making these schools real magnet schools, not just giving them a fancy name as they do now. Second, have real long-term educators running the school. No more of those "Leadership Academy Principals" with limited classroom experience who think that they're CEO's of the school and refuse to collaborate with the staff. Chancellor Carmen Farina has said that 300 Principals should not be in charge of their schools but has failed to remove them, why? That might mean recombining many of these small schools back to the large comprehensive schools they came from. Third, have an experienced teaching staff, parents are not stupid, they may be ignorant of the New York City schools but they know about their child's teacher and if the teacher is a "newbie", many of the parents will request a more experienced teacher and if the school suffers from high teacher turnover, parents will not want their children going to the school. Just take a look at Campus Magnet and the four failing schools that inhabit the old Andrew Jackson Campus. Finally, the poor academic performance of the school turns off the parents and only those children who have uninvolved parents will allow their child to go to these low academically performing schools. Therefore, its important to bring in "quality teachers" and a school administration that works collaboratively with staff and low class sizes as a start to improve the school's academic performances. Once the school shows real academic progress and has courses, with certified teachers, that attract the higher preforming student, than the school will gradually acquire a more diverse population. Good schools have a diverse student population and the reason they have diversity is because many of these schools have strong leadership, experienced teachers, and manageable class sizes along with consistent student discipline codes. So far the DOE has failed miserably to do what's necessary to integrate the schools and close the student academic achievement gap. Beware Of ATR Field Supervisors Bearing Gifts. The DOE, in their attempt to thin out the herd of 1,400+ ATRs, has hired more ATR field supervisors to convince the ATRs that its time to resign, retire, or just leave the system out of frustration and despair. It appears many of the ATR field supervisors are retired administrators, working part-time to make a few extra shekels and with orders to terminate the ATRs. The ATR supervisors all seem to have the same message. They meet with the ATR and pretend to offer them support. They tell the ATR that their job is to help them land a permanent position and by observing the ATR in the classroom they could offer suggestions on how to improve their pedagogy and make them more attractive to principals. The truth is far different than the message. 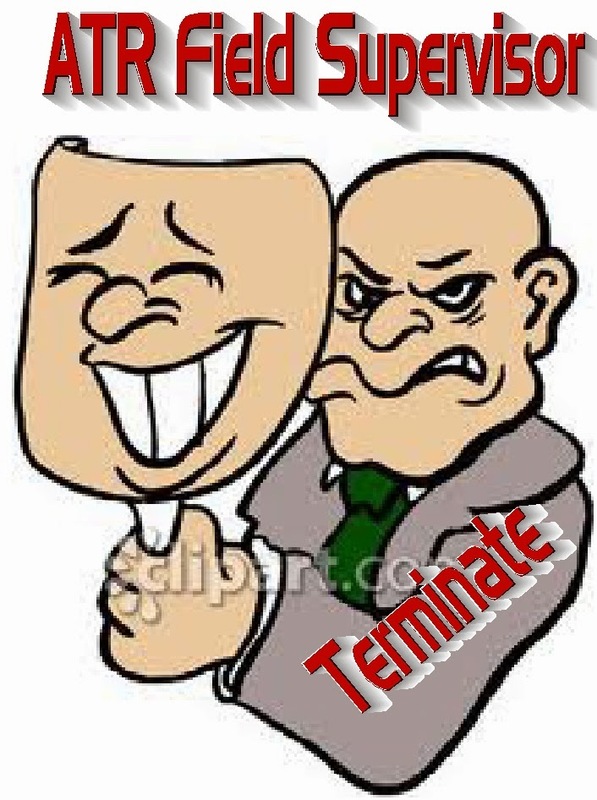 The ATR supervisors have little or no influence on principals and cannot help the ATR obtain a permanent position. 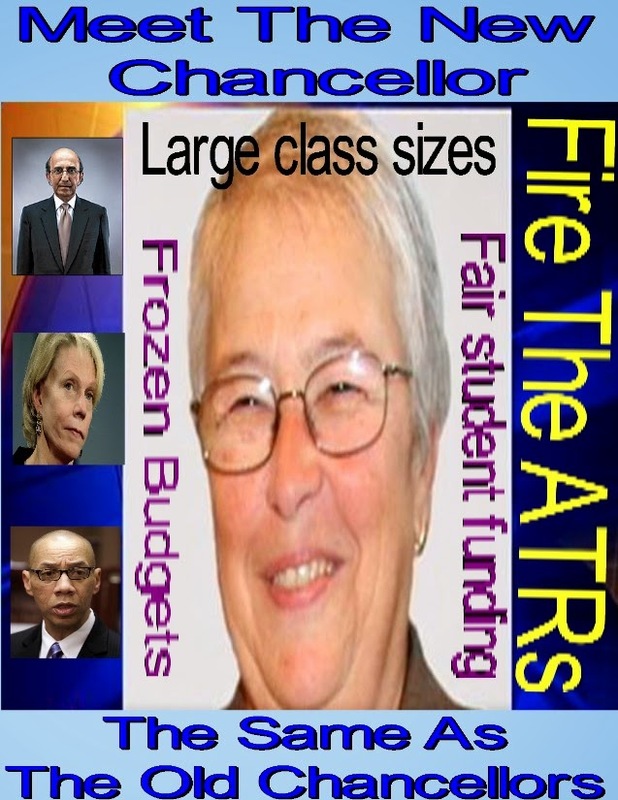 Moreover, with "Fair student funding" still in effect, principals are looking for young and inexpensive teachers, preferably untenured, and since the average ATR are in their 50s, have an average of sixteen years experience, and make $87,000, few principals would even consider hiring the ATR. With regard to supporting the ATR in improving their pedagogy? Its laughable. Most are playing the "gotcha system". They will show up numerous times, rip the teacher's lesson to pieces and if the lesson was great, they will claim the lesson plan did not match the lesson, despite the union winning a grievance that administrators cannot evaluate the teacher's lesson plan. I guess the DOE forgot to tell the ATR supervisors that. In one outrageous case an ATR supervisors gave an "unsatisfactory" observation to a Science teacher who was covering a Spanish class. Many of the ATR supervisors demand "rigor", "differentiation", and "Common Core" in the lessons despite the obvious fact that the ATR has no training in them, or has any knowledge of the student abilities in the classroom with and has no ownership of the students grades to help with discipline. They expect you to have everyone in the classroom engaged and learning and if one student is not on task, the lesson is considered a failure by the ATR field supervisor. Worse, once the ATR field supervisor's rating is final, it can only be appealed to the DOE's kangaroo court, where only 0.3% of these appeals have been reversed by DOE hearing officers. Therefore, its necessary to be proactive and challenge the ATR field supervisors on what they observed. Question them about every sentence they write, even for the imformals, since they can be used against the ATR in the 3020-a hearings, if it comes to that. Finally, don't let these ATR supervisors browbeat you into submission. If you disagree with the supervisor's observation report, file a grievance and make them realize that they will need to defend their observations, maybe they will look for more compliant ATRs they can bully and leave you alone. If you're in danger of getting an "unsatisfactory rating" then you must fight "tooth and nail" on the ATR field supervisor's observation because by not objecting to the observation report, you make it easier for them to give you an "unsatisfactory rating" and two consecutive "unsatisfactory ratings" can result in 3020-a termination charges. The ATR Alliance (ATRA) is having a meeting at 512 Clinton Avenue (the Freedom School) in Brooklyn on February 12th. from 5:30 to 7:30 pm. Elections will be held for new representatives. If you are an ATR please attend. All UFT members are welcomed ATRs or not. 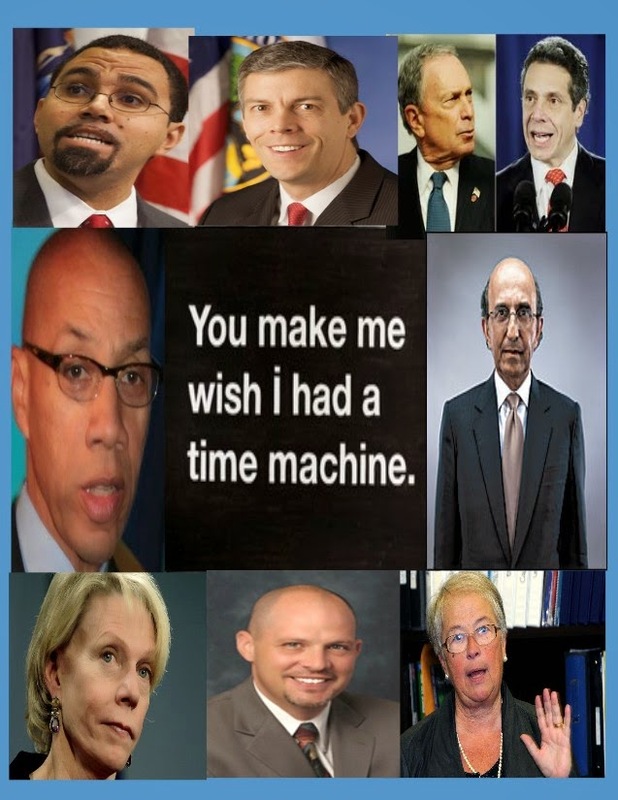 Stupid Sayings That Our Education Leaders Probably Regretted. Over the years many of the education community heard some very questionable and downright stupid statements by politicians and other education leaders. This post will remind you of these stupid sayings that our education leaders have said or did over the years and probably regretted saying. "Hurricane Katrina was the best thing that happened to New Orleans Schools". This more than his equally stupid comment ny saying “white suburban moms who — all of a sudden — their child isn't as brilliant as they thought they were, and their school isn’t quite as good as they thought they were.”quip, resulted in many of his supporters to cringe and distance themselves from his out of touch education policies. Chancellor Joel Klein: “The single most important factor determining whether students succeed in school is not the color of their skin or their ZIP code or even their parents’ income—it is the quality of their teacher.” and that "Poverty is no excuse as we have narrowed the achievement gap". The NYC schools Chancellor said this as New York State kept lowering the passing cut schools to present the illusion of progress. When the State cut scores were finally adjusted to reflect the actual academic skills, the racial/income achievement gap actually widened. This embarrassment resulted in Mayor Bloomberg asking for Joel Klein to resign. Mayor Michael Bloomberg: “If I had the ability, which nobody does really, to just design the system and say, ex cathedra, this is what we’re going to do, you would cut the number of teachers in half, but you would double the compensation of them, and you would weed out all the bad ones and just have good teachers. And double the class size with a better teacher is a good deal for the students,” The Mayor was roundly criticized as there was pressure to reduce class sizes and educators were questioning diverting State money that was earmarked to reduce class sizes to other uses in the DOE. Moreover, in a NY1 interview he stated that "experience is not important when it comes to teaching". Chancellor Cathie Black: "How about practicing birth control" when responding to a parent complaint about overcrowding. In the very same meeting she said she has "a Sophie's choice" when it came to allocating space. Chancellor Dennis Walcott: "I have zero tolerance for teachers accused of sexual misconduct and they should be fired" then after making that statement he hires a person who was found guilty in a court of law of sexual harassment to be Principal of Flushing High School. In addition, when a Principal he liked was accused and substantiated by OEO of of repeated sexual harassment of his female staff, he kept the Principal in place and told the press “Just because an accusation is made doesn’t mean a person is guilty.” Talk about a double standard, what a hypocrite! Chancellor Carmen Farina: " Its a beautiful day" when responding to reporters on why she kept schools open during a raging snow and ice storm that stranded many and put school children at risk. Honorable mention should be given to her comments to new teachers in which she said something to the effect "don't listen to those veteran teacher complaints in the teacher's lunchroom". UFT President Michael Mulgrew: “So I stand here in support of this for one simple reason: if someone takes something from me, I’m gonna rip it right back out of their cold, twisted, sick hands and say it is mine. You do not take what is mine. And I’m gonna punch you in the face and push you in the dirt because this is the teachers, these are our tools and you sick people need to deal with us and the children that we teach. Thank you very much,” . In reality most teachers would like to punch Mr. Mulgrew in the face for imposing Common Core on us and eliminating the joy of learning for their students and for agreeing to the "junk science" called the Value Added Method. NYSED John B. King: Telling the press that parents, students, and educators that showed up and complained about the poorly implemented high stakes Common Core tests were "special interests". Of course he failed to hold himself accountable for the faulty and flawed implementation of the State's teacher evaluation system and the high-stakes Common Core tests. Governor Andrew Cuomo: Who calls himself "a student lobbyist" while shortchanging the schools of education funds and forcing them to take the high stakes Common Core tests that brings out the student's fear and hatred of the test while taking the joy out of learning for these students. Moreover, he wants to hold education funding hostage over his insistence to impose a draconian teacher evaluation system and to fund more charter schools at the expense of the public school budgets. Making students pawns in his "its my way or the highway" policy is not being a student lobbyist in my book. I'm sure I missed some and you can tell me what they are in the comment section.